Correction on confession.. my husband had to force me to get outta bed this morning with his cold foot on the back of my leg action. Which made me wish I'd signed up for those Taekwondo lesson so I could go all Bruce Lee. Because really, putting your cold feet on the back of someones leg deserves a karate chop to the neck. It’s so hard to get back into the swing of things after being on vacation. Especially when you’re expected to function at full capacity in the workplace..
Good thing is, I’ve never functioned at full capacity so people know not to expect much already. Bad thing is, that doesn’t stop them from bothering me. So I’m forced to be courteous and helpful as I make my way down the hall. In the process, people stop me to say “Welcome Back. About that report” or “How was your trip, you think you could take a look at this before getting settled in”. This just makes me pick up my pace and act like I can’t hear the guy down the hall telling me that he can’t get logged into his system this morning. I want to say "how the hell did you log in yesterday or the past 2 weeks that I haven’t been here". Instead, I break into a slow jog until I make it to my office, shut my door and hide under my desk until lunchtime. This will be my routine for the rest of the week. Or until I get it together. Not sure how long that will take. Luckily I brought this salad. Which was made with some leftover rotisserie chicken yesterday for lunch. The warm chicken and nectarines go well with the peppers, and the mustard vinaigrette brings it all together perfectly. It worked out so well for my lunch, which I enjoyed in the solitude of my office. While sitting under my desk watching the second season of Scandal on Hulu. Mr.President! Tomorrow I think I'll work from home. 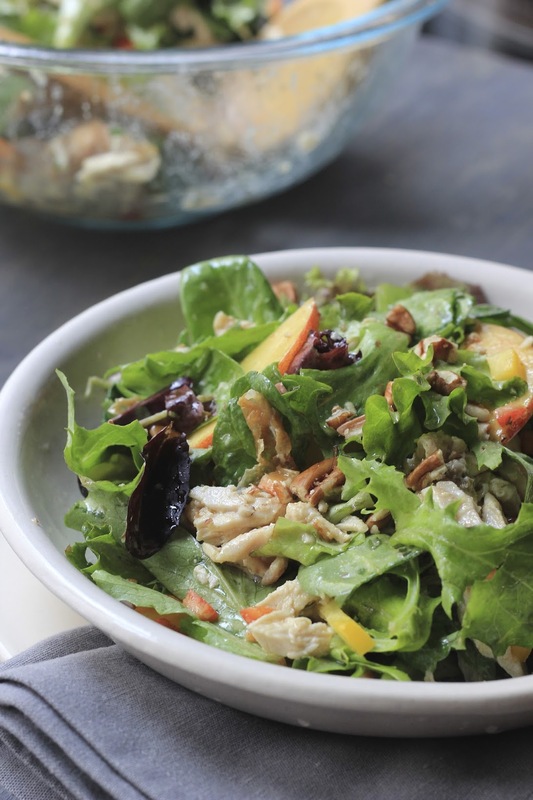 Combine chicken, mixed greens, peppers, nectarines and pecans in a large bowl. In a separate small bowl, whisk together rosemary, shallots, lemon juice, sherry vinegar and mustard to combine. Continue whisking while slowly adding in olive oil until emulsified. Add dressing to salad and toss until well combined. Serve immediately. Note to self- the chicken can also be added in cold..or not added at all. I like hot chicken on my salad..I'm weird like that.. won't you join me on the hot chicken on salad train.